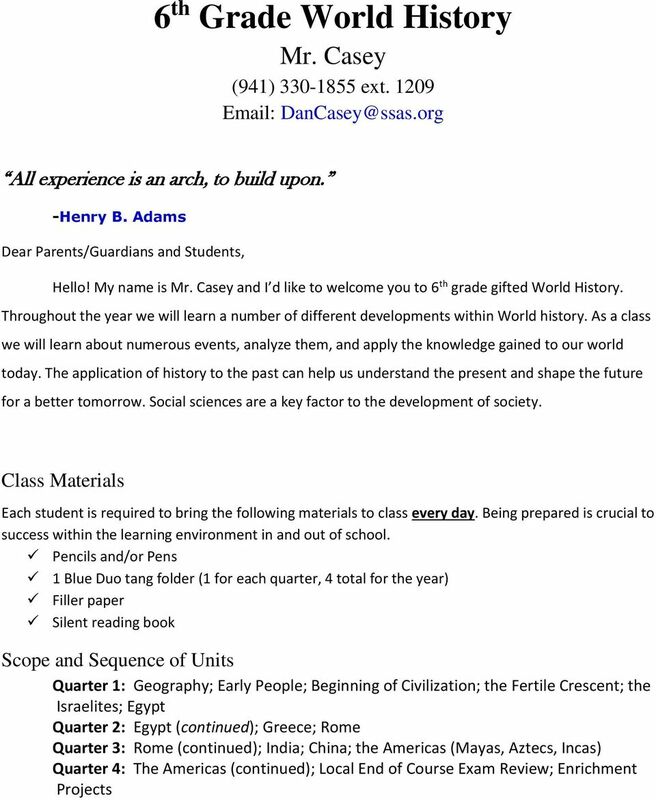 Download "6 th Grade World History"
2 Grading Policies The grading of this course will involve a variety of assignments and methods. Some assignments are worth more than others. Student s work is broken down into the various weights below based on percentages. Homework will seldom be assigned, often no more than 1 night a week. Homework will exercise critical thinking that needs to be completed at home of the assigned night. Homework is worth 15% of the students grade. This may not seem like much, but missing homework assignments can eventually hurt your grade. 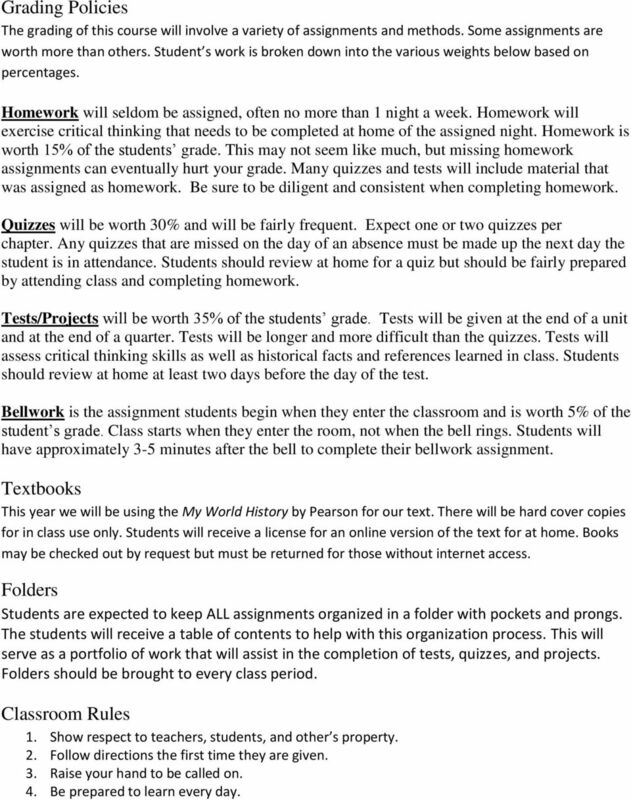 Many quizzes and tests will include material that was assigned as homework. Be sure to be diligent and consistent when completing homework. Quizzes will be worth 30% and will be fairly frequent. Expect one or two quizzes per chapter. Any quizzes that are missed on the day of an absence must be made up the next day the student is in attendance. Students should review at home for a quiz but should be fairly prepared by attending class and completing homework. Tests/Projects will be worth 35% of the students grade. Tests will be given at the end of a unit and at the end of a quarter. Tests will be longer and more difficult than the quizzes. Tests will assess critical thinking skills as well as historical facts and references learned in class. Students should review at home at least two days before the day of the test. Bellwork is the assignment students begin when they enter the classroom and is worth 5% of the student s grade. Class starts when they enter the room, not when the bell rings. Students will have approximately 3-5 minutes after the bell to complete their bellwork assignment. Textbooks This year we will be using the My World History by Pearson for our text. There will be hard cover copies for in class use only. Students will receive a license for an online version of the text for at home. Books may be checked out by request but must be returned for those without internet access. Folders Students are expected to keep ALL assignments organized in a folder with pockets and prongs. The students will receive a table of contents to help with this organization process. This will serve as a portfolio of work that will assist in the completion of tests, quizzes, and projects. Folders should be brought to every class period. Classroom Rules 1. Show respect to teachers, students, and other s property. 2. Follow directions the first time they are given. 3. Raise your hand to be called on. 4. Be prepared to learn every day. 3 Plagiarism SSA+S has a zero tolerance policy regarding cheating. Those behaviors include talking during a test, plagiarism, copying answers or being in possession of answers for assignments, or giving answers for assignments to another student (this is not all-inclusive). First offense: A zero on the assessment and a detention. (Parents will be notified). Second offense: A zero on the assessment and a suspension. (Parents will be notified). 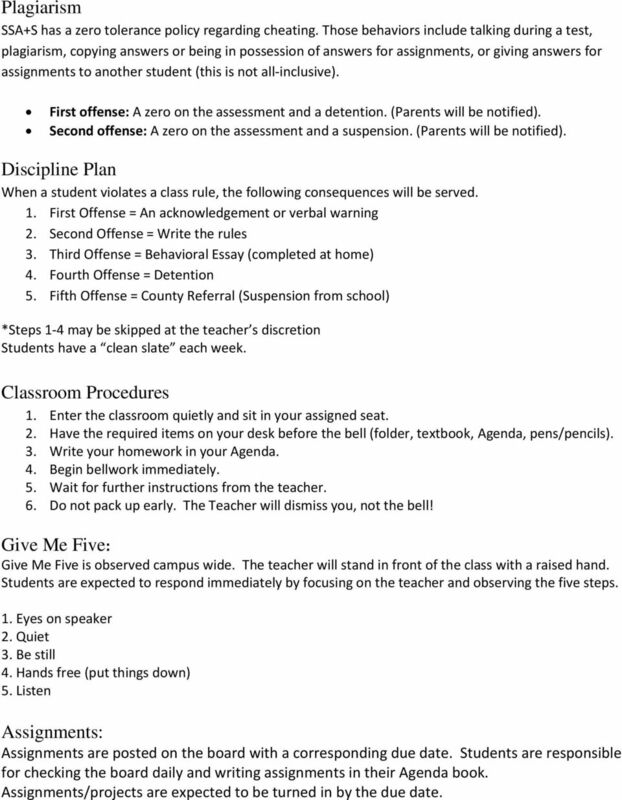 Discipline Plan When a student violates a class rule, the following consequences will be served. 1. First Offense = An acknowledgement or verbal warning 2. Second Offense = Write the rules 3. Third Offense = Behavioral Essay (completed at home) 4. Fourth Offense = Detention 5. Fifth Offense = County Referral (Suspension from school) *Steps 1-4 may be skipped at the teacher s discretion Students have a clean slate each week. Classroom Procedures 1. Enter the classroom quietly and sit in your assigned seat. 2. Have the required items on your desk before the bell (folder, textbook, Agenda, pens/pencils). 3. Write your homework in your Agenda. 4. Begin bellwork immediately. 5. Wait for further instructions from the teacher. 6. Do not pack up early. The Teacher will dismiss you, not the bell! Give Me Five: Give Me Five is observed campus wide. The teacher will stand in front of the class with a raised hand. Students are expected to respond immediately by focusing on the teacher and observing the five steps. 1. Eyes on speaker 2. Quiet 3. Be still 4. Hands free (put things down) 5. Listen Assignments: Assignments are posted on the board with a corresponding due date. Students are responsible for checking the board daily and writing assignments in their Agenda book. Assignments/projects are expected to be turned in by the due date. 4 Late Assignments: Late assignments will result in a loss of 10 points for each day late. After 3 days, the highest grade a student may earn is 50%. Paper Heading: All assignments are to be headed with your first and last name, date, class period, and assignment in the upper right hand corner of the paper. Restroom: Students are expected to take of using the restroom between classes. If a pass is needed during class, a student must fill out their Agenda and bring it to the teacher. Do not raise your hand to request a pass. Simply fill it out and bring it to me quietly. All students must sign out and back in upon their return on the sheet by the door when using the restroom. Only one student may leave the room at a time. Tardies: Students are marked tardy if they are not in their seat working when the bell rings. 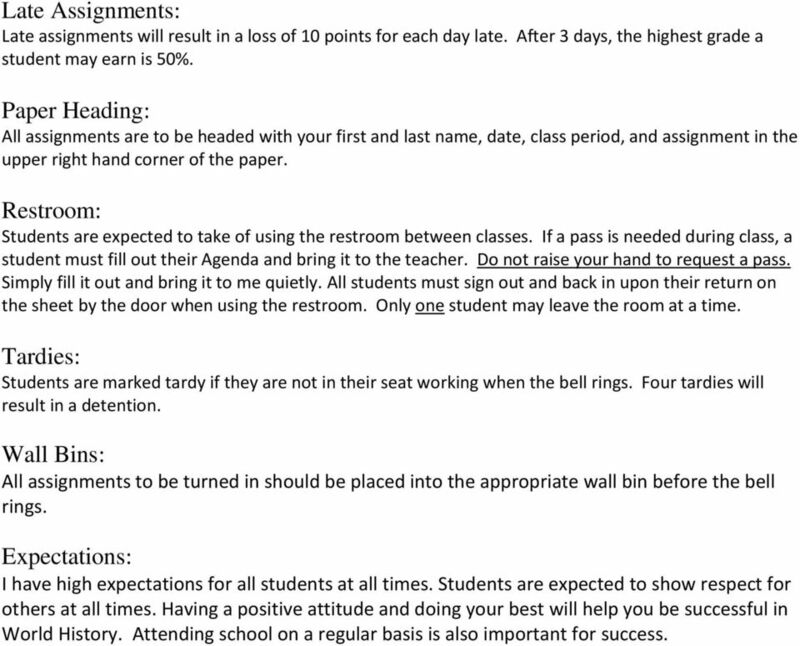 Four tardies will result in a detention. Wall Bins: All assignments to be turned in should be placed into the appropriate wall bin before the bell rings. Expectations: I have high expectations for all students at all times. Students are expected to show respect for others at all times. Having a positive attitude and doing your best will help you be successful in World History. Attending school on a regular basis is also important for success. 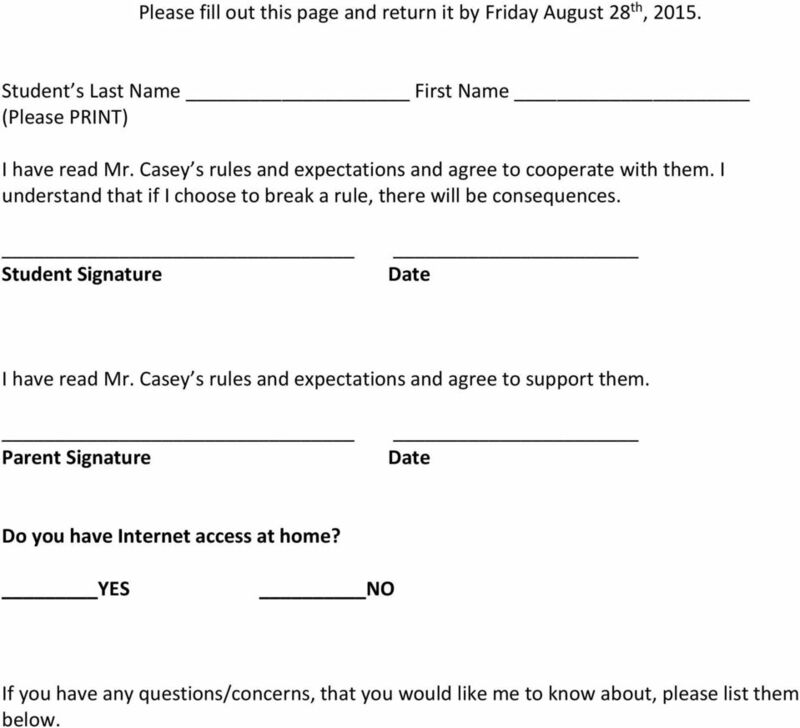 5 Please fill out this page and return it by Friday August 28 th, Student s Last Name First Name (Please PRINT) I have read Mr. Casey s rules and expectations and agree to cooperate with them. I understand that if I choose to break a rule, there will be consequences. Student Signature Date I have read Mr. Casey s rules and expectations and agree to support them. Parent Signature Date Do you have Internet access at home? YES NO If you have any questions/concerns, that you would like me to know about, please list them below. Welcome to Señorita Kopec s Spanish class! AP United States Government Mr. Stallard Room 126 eastalla@smsd.org @smeapgov 913-993-6671 (school) This is a political science course, not a history course. Some of the information you learned in U.S.